BLT Pasta Salad is America’s favorite BLT sandwich turned into America’s favorite spring and summer side dish! 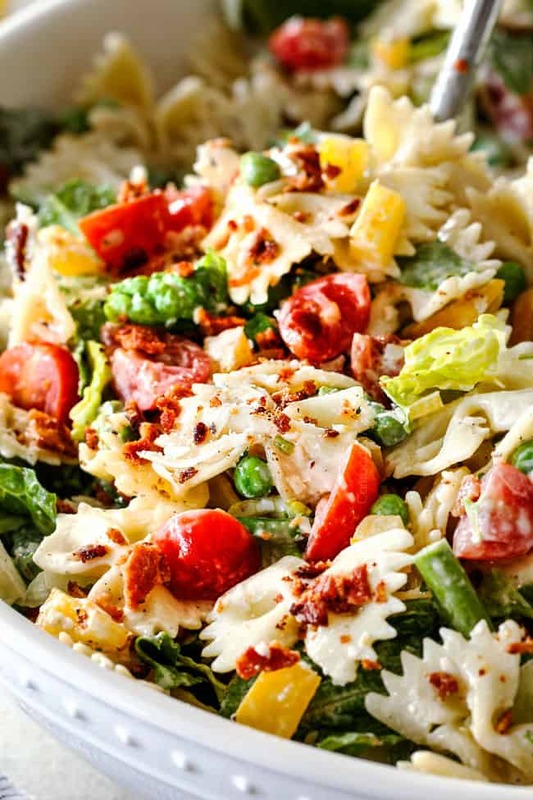 BLT Pasta Salad is bursting with not only crispy Bacon, crunchy Lettuce and juicy Tomatoes but fresh asparagus, peas and peppers doused in to-live-for bright, tangy, creamy Lemon Chive Dressing for the most irresistible pasta salad ever! It’s hearty, flavorful, super easy, make ahead friendly and about to become your favorite company or potluck side. And that dressing!!!!! You guys, I have waaaaaay too many recipes I want to share with you before Easter so only the best of the best are making the cut like my Potatoes Au Gratin with Bacon and Gruyere, Carrot Cake Cookies, Coconut Cake, Brown Sugar Glazed Ham, Lemon Blueberry Cake, and three more next week. 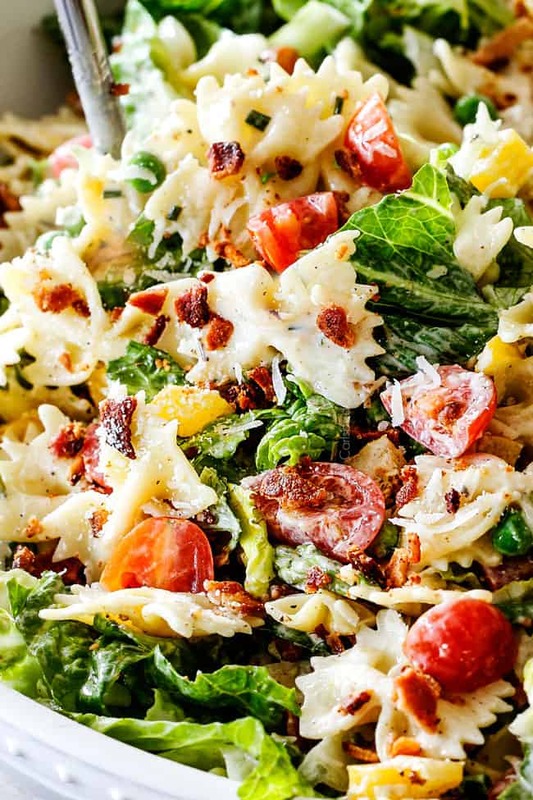 And when I say best of the best, I mean this BLT Pasta Salad recipe! 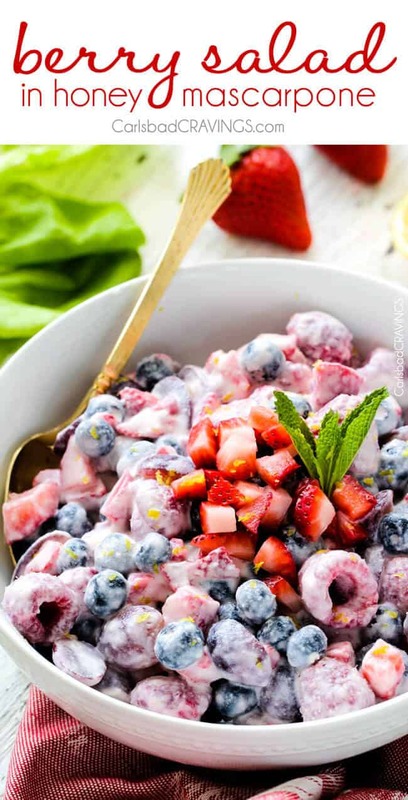 It’s sooooo good – I was eating it for breakfast the next day! 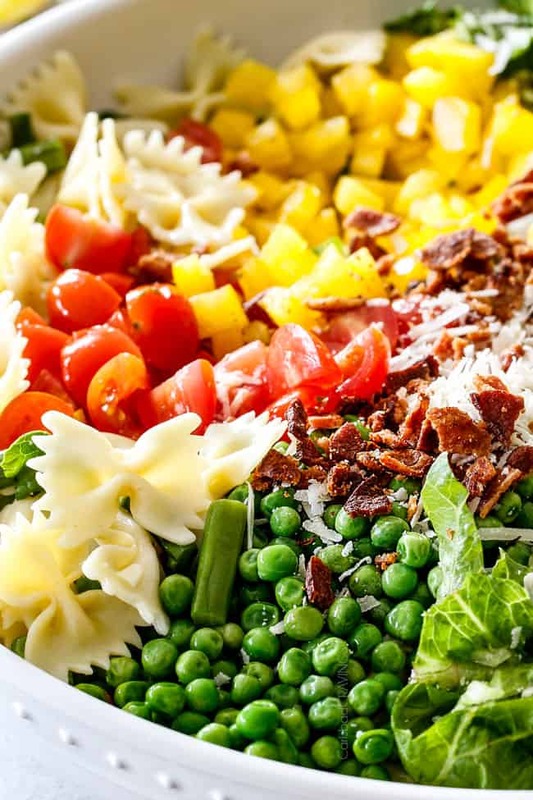 The medley of veggies in this BLT Pasta Salad create a harmonious blend of bright, fresh crunchy textures, complimented by the salty Parmesan and crispy bacon and all married together by tantalizing Lemon Chive Dressing. And if you’ve ever tried lettuce in your pasta salads before – it’s fabulous, so don’t be scared away! 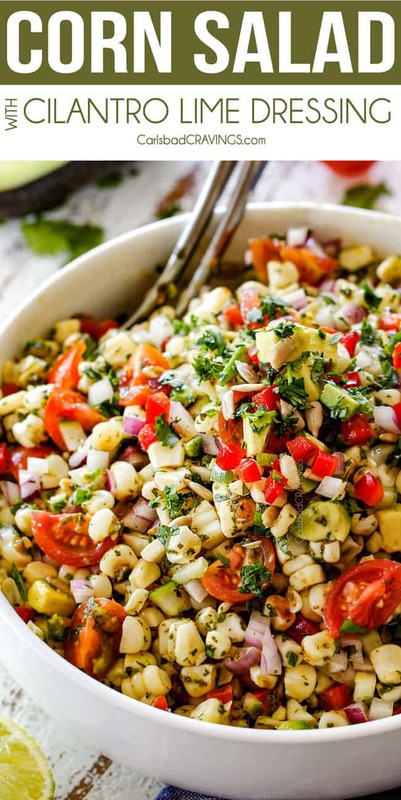 A pasta salad recipe is only as good as the dressing and THIS dressing is everything. I am obsessed. So obsessed, I already have plans to make a Parmesan version for my upcoming Creamy Bacon Pea Pasta Salad. 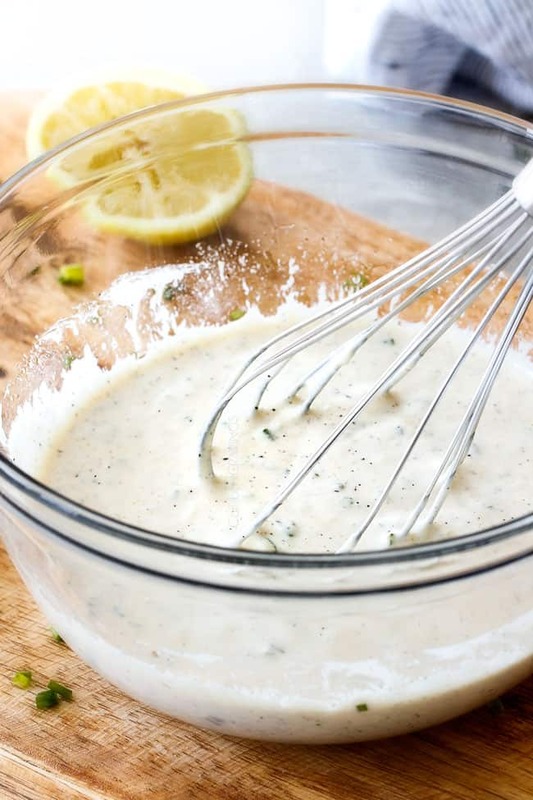 The dressing is lusciously creamy so it envelops your pasta and veggies beautifully and is infused with oregano, parsley, chives and most importantly, lemon juice and lemon zest. It’s vibrant and tangy and makes the BLT Pasta Salad dance with deliciousness. 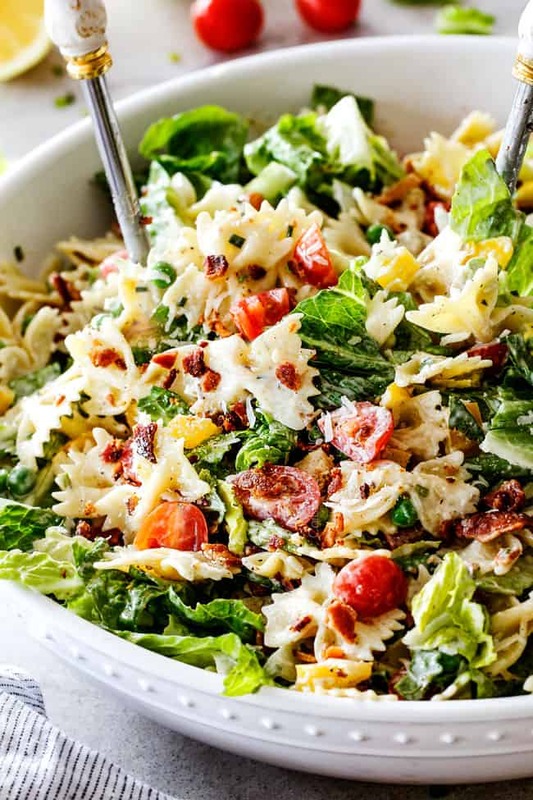 This BLT Pasta Salad recipe is pretty straightforward but I’ve included some tips and tricks to make your life easier and your BLT Pasta Salad the best ever. I like to use mini bowtie/farfalle pasta like in my Cowboy Pasta Salad but any medium pasta will work well. If you can’t find mini farfalle then regular is also fine. 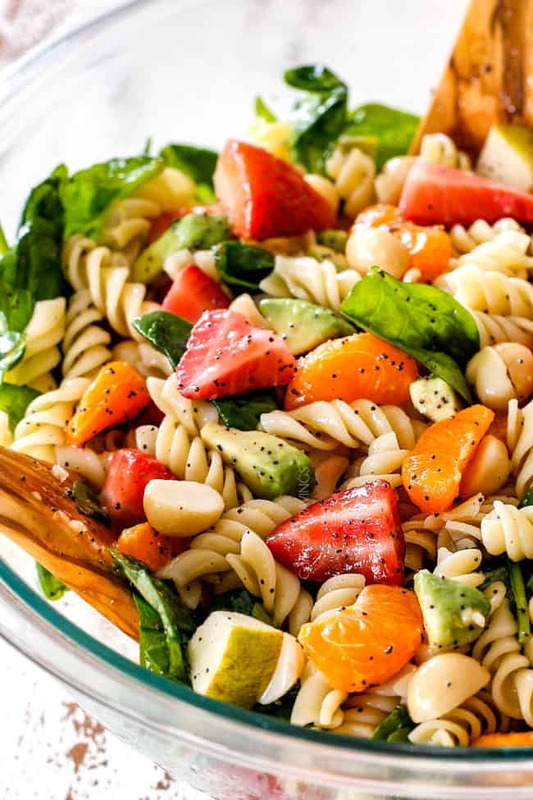 It is important to not overcook your pasta – you want it al dente so it still has a little bite otherwise the pasta salad will be soggy. We want creamy – not soggy. To stop your pasta from cooking after it’s removed from the heat, rinse and drain it in cold water then drizzle it with a touch of olive oil to keep it from sticking together. The easiest way to cut asparagus and eliminate the woody stems is to snap them at the ends because they will naturally break apart where the tough ends begin. I like to use the Romaine lettuce closest to the stem as it holds the most refreshing crunch and discard the top flimsy pieces. Make sure you are using petite frozen peas as they taste fresh and almost crunchy vs. mushy. 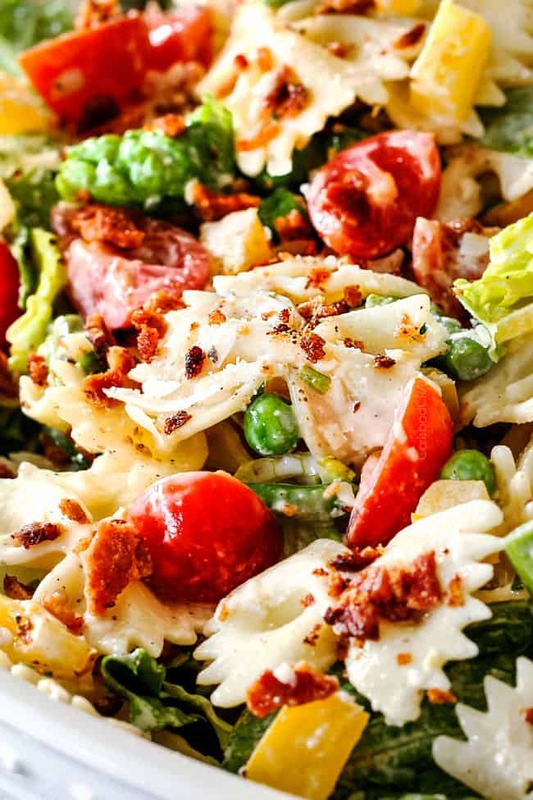 It is essential to use thick-cut bacon in this BLT Pasta Salad recipe so it retains its meaty texture when covered in the creamy dressing. I love fresh chives in the dressing but if they are too expensive or hard to come by then you can substitute 1 tablespoon dried chives. 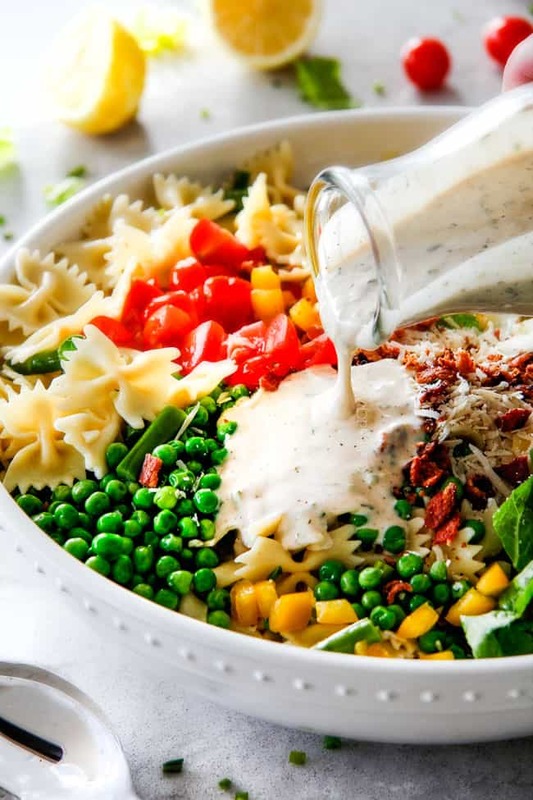 Unlike vinaigrette dressings, you will want to make sure the pasta is completely cool before mixing in the creamy dressing to ensure the dressing doesn’t separate. Try adding some chicken to turn this into a main course! 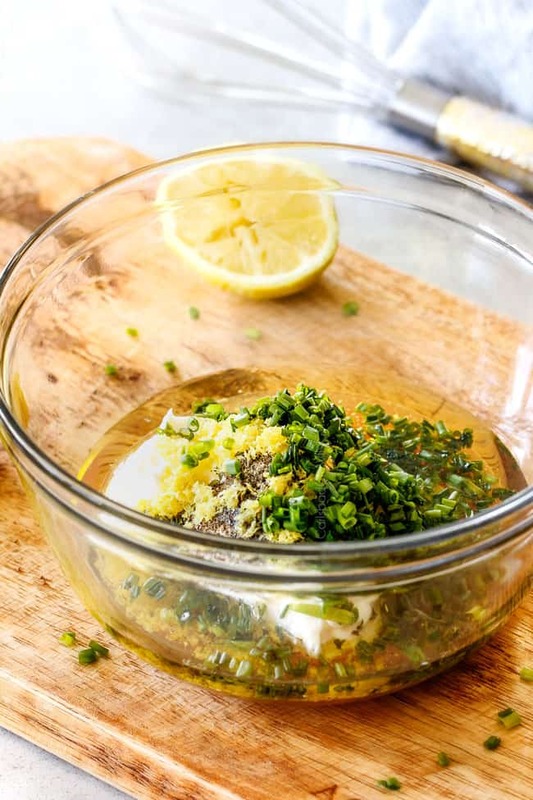 You can make the Lemon Chive Dressing up to 24 hours in advance and store in an airtight container in the refrigerator. If you choose to make it this far in advance, you might want to add a little more lemon before tossing as the lemon will mellow over time – just taste first and then make the call. You can prep all of the BLT Pasta Salad ingredients in advance making this a fabulous make ahead side. Add the pasta, asparagus, peas, bell peppers and cherry tomatoes to a large bowl and toss with half of the dressing once the pasta has cooled (so the dressing doesn’t separate). Cover with plastic wrap and refrigerate. Refrigerate the lettuce, bacon and Parmesan separately. When ready to serve, add the lettuce, bacon and Parsley and the remaining dressing and toss until evenly combined. This BLT Pasta Salad recipe is equally delicious as it is easy which means you have a new side that’s sure to be a hit every time you make it and everywhere you bring it – staring with Easter! Looking for more Pasta Salad Recipes? 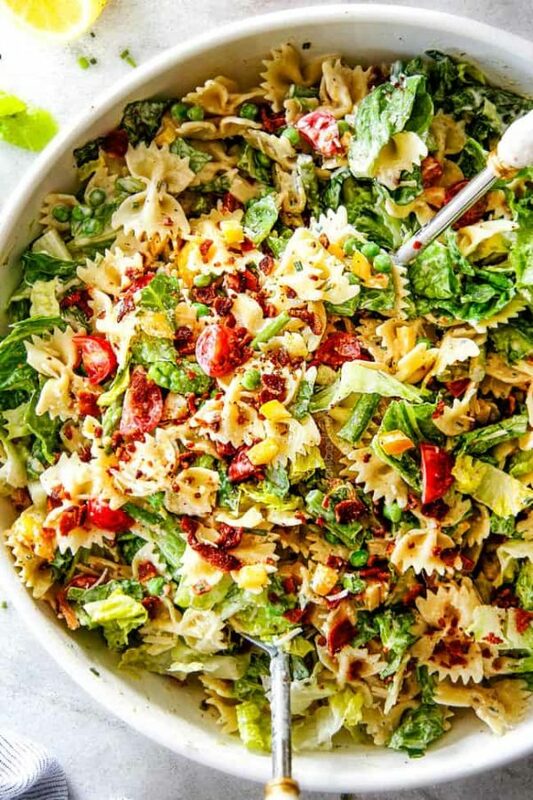 Want to try this BLT Pasta Salad Recipe? 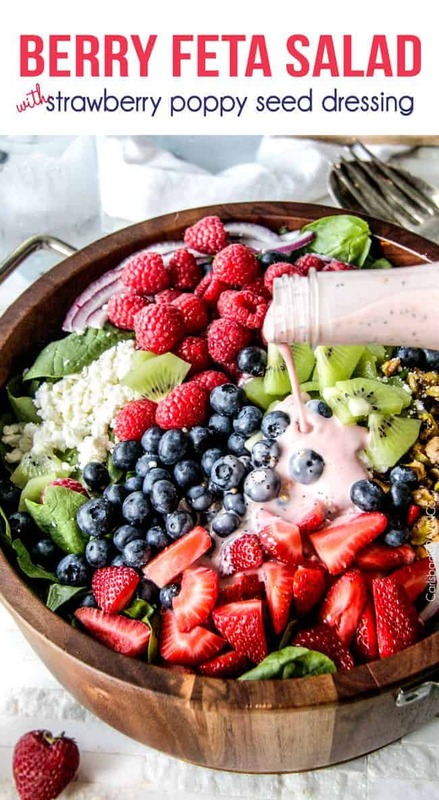 Pin it to your SALAD, SIDE, PASTA or SUMMER board to SAVE for later! BLT Pasta Salad is America’s favorite BLT sandwich turned into America’s favorite spring and summer side dish! 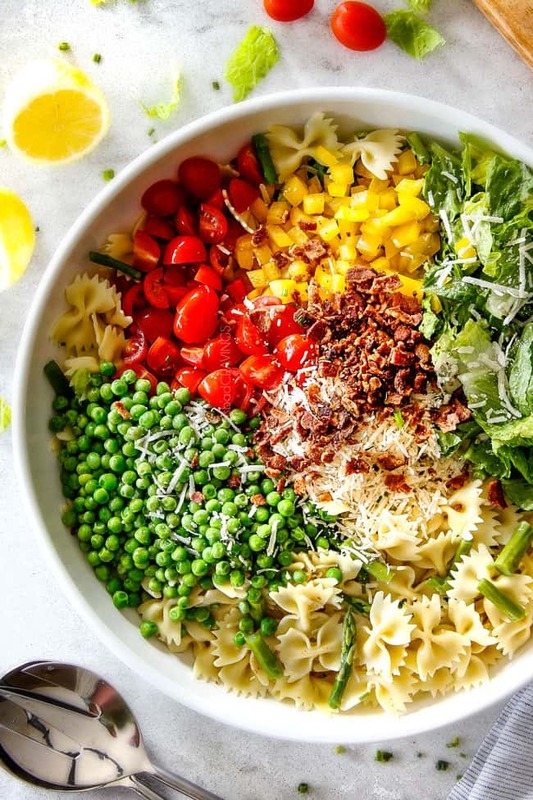 This BLT Pasta Salad recipe is bursting with not only crispy Bacon, crunchy Lettuce and juicy Tomatoes but fresh asparagus, peas and peppers doused in to-live-for bright, tangy, creamy Lemon Chive Dressing for the most irresistible pasta salad ever! It’s hearty, flavorful, super easy, make ahead friendly and about to become your favorite company or potluck side. Cook pasta in generously salted water just short of al dente, then add the asparagus to the pot and cook with the pasta for 1 more minute. Drain the pasta and asparagus, rinse with cold water then toss with a drizzle of olive oil to keep pasta from sticking. 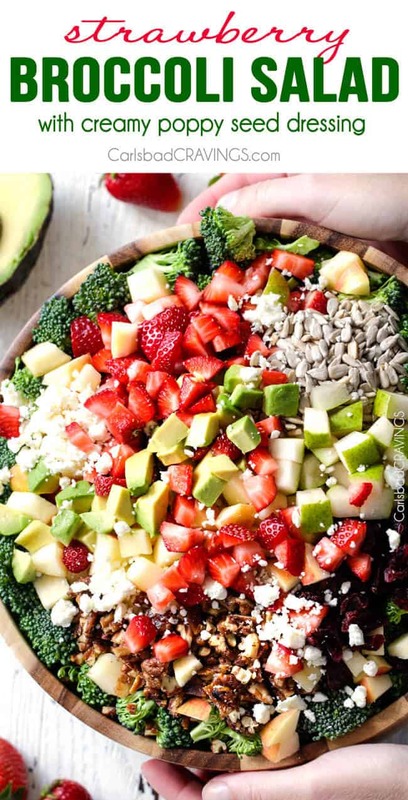 Add all of the salad ingredients to a large bowl. Once pasta has cooled, add Lemon Chive Dressing and toss until evenly coated. Season with additional salt and pepper to taste (I like more pepper). Serve immediately. Add pasta, asparagus, peas, bell peppers and cherry tomatoes to a large bowl and toss with half of the dressing once the pasta has cooled. Cover with plastic wrap and refrigerate. Refrigerate the lettuce, bacon and Parmesan separately. When ready to serve, add the lettuce, bacon and Parmesan and the remaining dressing and toss until evenly combined. Taste and add a splash more lemon if desired and salt and pepper to taste (I like more pepper). *Discard the very top flimsy part of the Romaine because it doesn’t have as much crunch then use the lettuce closest to the bottom stem for maximum crunch. **You can make the dressing up to 24 hours in advance and store in an airtight container in the refrigerator. If you choose to make it this far in advance, you might want to add a little more lemon before tossing as the lemon will mellow over time – just taste first and then make the call. This pasta salad is so perfect for Easter! I just bought some bunny shaped pasta for a pasta salad, but didn’t know which one to make. YAY! I’m glad I could help you with your bunny shaped pasta dilemma 🙂 That will be so cute! I hope you and your family have a fabulous Easter!!! All your recipes are delicious and the pictures are fantastic. What a kind comment, thank you so much Marjie!!! You have posted many amazing salads, but this one is your best yet. I could bathe in the dressing alone and the combination of flavors is just wonderful. Thanks so much for all of your wonderful recipes. Your comment made my day! Thank you so so much Shannon, I SO appreciate your awesome comment! I am right there with you – this is one of my all time favs ever – I’m thrilled you loved it so much too! Great salads! I really enjoy your blog and my family is eating much better. Thank you so much for your kind words Kathleen! I have many more salads coming now that salad season is upon us! Do you think this would be equally amazing without the pasta? I’d like to serve it alongside a pasta dish. It sounds delicious! Hi Jill, the dressing really is best on pasta. If you wanted to just make the dressing for a green salad then I would use less mayo. Enjoy! I can make a meal on just your wonderful salads! And since I like to grow my own herbs, the taste is always so fresh (though, unfortunately, we don’t have a very long growing season). And I love anything lemon! I was wondering your thoughts about substituting fresh dill (for the chives, though then I’d replace their wonderful flavor with scallions or chopped onion) or adding it, and using it in potato salad or macaroni salad. Hi Lin, I was on a cruise without internet for over a week and I am all sorts of behind but thank you so much for your comment! I’m thrilled you are loving my salad recipes and that is amazing you grow your own herbs! As far as replacing the chives, with dill, I think that would be fabulous IF you are looking for that flavor profile which I think would be wonderful as you suggested in potato or macaroni salad. YUM! So yes, in those applications, I think it would be great! I’ve been missing summer and fresh veggies so much as it’s been a long winter here in Minnesota. This is why I had to take this along for my family’s Easter. After listening to multiple people say “this hit the spot,” I can say this was a huge hit! I cannot wait to make this salad this summer with my own veggies from the garden. 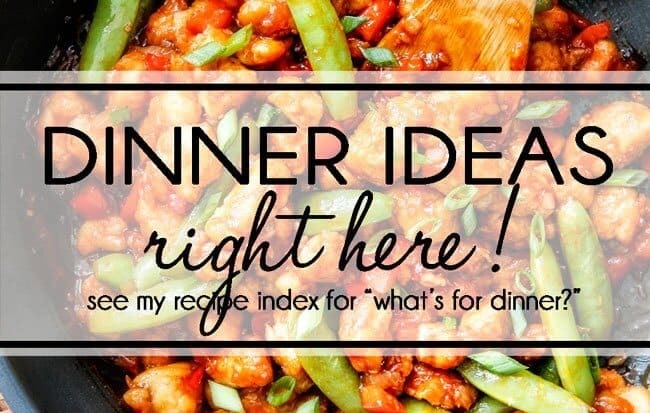 Thank you for continuously making and sharing fabulous recipes that I can share with others! You are so welcome Hannah, thank you for taking the time to comment! I’m so pleased this BLT Pasta Salad was a huge hit – and it sounds like it will be amazing with your own garden vegetables! I hope spring weather comes your way soon!